Trade Show Holograms announces new life size 3d holographic virtual presenter. Trade Show Holograms has just announced its latest addition to the trade show exhibit market. Fiona a life size 3d holographic trade show robot and virtual presenter who will be available for rental in both the USA and Canada soon. This stunning visual effect is created by a 3D hologram projector. 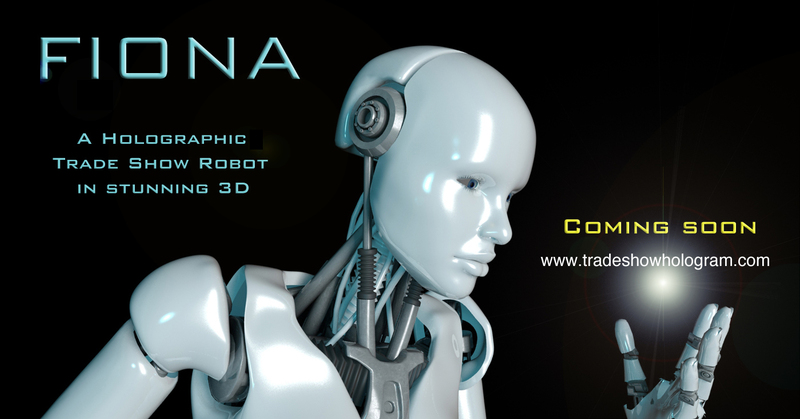 Fiona appears as s 3D Holographic presentation and speaks to visitors at your trade show booth. In addition to Fiona herself she can electronically conjure up floating images of any product in holographic form. Unlike other virtual promoters and presenters Fiona has full motion and appears in 3D instead of the flat 2D appearance of the half body virtual presenters seen at trade shows. Trade Show Holograms has been creating custom holograms for Americas top corporations for over 7 years. Their presentations has amazed trade show attendees across North America and they are confident that Fiona is the next step in trade show entertainment. Holographic Trade Show Virtual Presenter and Promoter.